Eurol calls for tailored oil | Eurol B.V.
A decade or so ago, garage mechanics could only choose between two oils. Today, however, that number has increased at least fivefold. ‘Car manufacturers have their own engine designs, and that means as many types of oil as there are designs,’ says Sebastiaan Nieland, a product application specialist at Eurol. 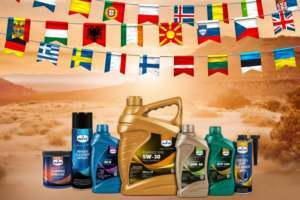 In this article, he discusses a few more trends that determine the choice of the right engine oil – i.e. a brand-specific engine oil. ‘It is clear that the selected engine concepts mean that oil needs to be even less viscous than it was. Lower engine speeds combined with the high demands made of the engines set high requirements for modern engine oils. From 15W-40 mineral oil, we are evolving to synthetic 0W-20 oils. As this low viscosity affects the oil’s lubricating capacity, more and more chemical compounds are being introduced to compensate. Tailored engine oils are the current trend, and unfortunately they cannot be used universally. Car companies are now aware of this. However, it remains important to be alert to the manufacturer’s specifications during oil changes. Mistakes can be costly if an engine breaks down due to using the wrong kind of oil. There are also other technical developments that play a role in the development of an engine oil, such as the start-stop systems. These have a significant impact on the wear and tear to the engine. The effectiveness and particularly the life span of soot filters in both diesel and petrol engines are partly determined by the choice of oil. These soot filters must not be allowed to clog up as a result of choosing the wrong oil. This is particularly crucial in the case of soot filters for petrol engines: gasoline particulate filters. Another technical problem relating to engines is LSPI, or low-speed pre-ignition. This is the almost unpredictable precombustion of the petrol and air mixture during the compression stroke. The problems arise from the red-hot carbon particles left behind. The causes of this are still the subject of discussion among technical experts, but in general the high pressures in the combustion chamber combined with the wrong type of engine oil are considered a major cause. The damage caused to the engine can be enormous: burnt pistons and bent connecting rods, for example. In any case, the right mix of calcium and molybdenum is important in the chosen engine oil in order to prevent LSPI as far as possible.